It is October! Can you believe it? Wedding in 10 days. Baby in ? days. And then before we know it - Halloween. Let's change the subject, please. 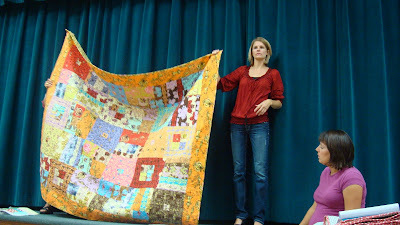 Tuesday night was Celebrate the 30s at our quilt group. Here is the lovely and fashionable Paula all decked out for our fun time. 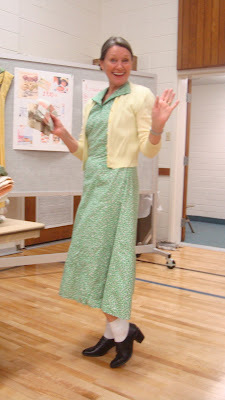 This dress was her grandmother's. Paula's grandmother passed away at age 46. The dress was made but not hemmed before she died. So Paula finished it and kept it. Beautiful isn't it. This post will showcase our Show-N-Tell. 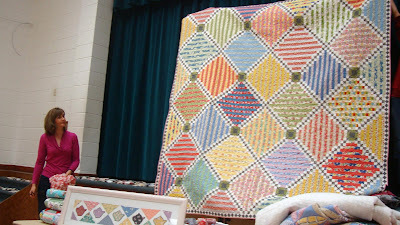 I'll save the 30s quilts for another post. We had a visit from the famous Jill Finley. Our Alpine area has several stars and Jill is definitely one of them. 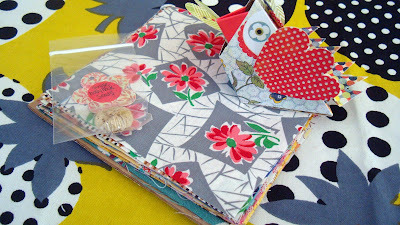 Her new fabric line is just out and she brought some fabric to share with some lucky winners. 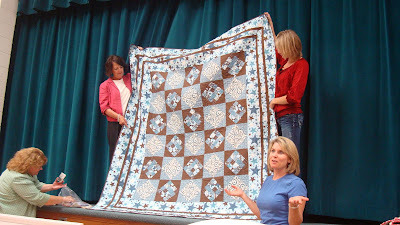 Before you know it she'll be at quilt market with her new quilts. Go wish her well at her blog Jillily Studio. 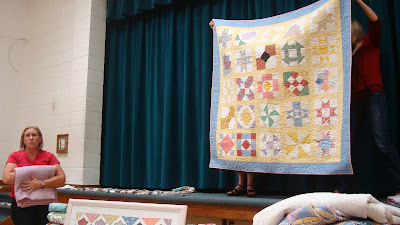 One of our local gals was a won a prize with her whole quilt machine quilting. It had amazing texture. Speaking of stars. 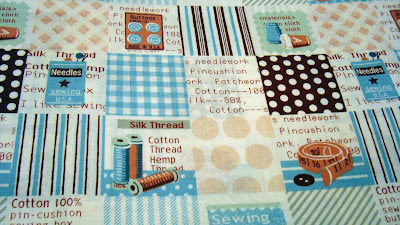 Alpine Fabric has some new quilts all ready for Market with their great fabric. There will be quite a few people representing from our area at Market. 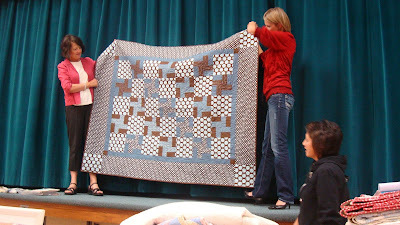 Jody's mom brought this amazing quilt home with her and it has a great story. 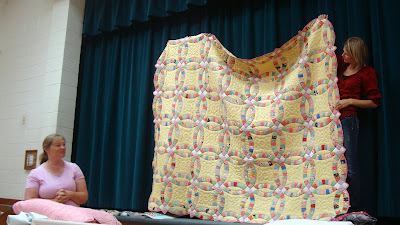 It was so fun seeing everything but the kitchen sink thrown into this quilt from wool to table cloth plastic. Lovely basket quilt with a story. The baskets are really amazing. 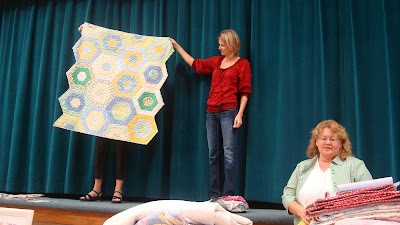 Jody won a prize with her quilt too. It was described as beautiful, heavy and organic. 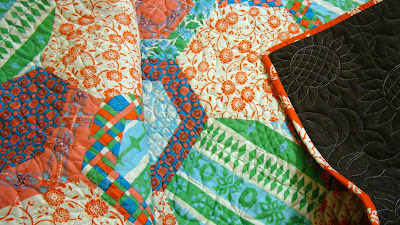 Love squares and I like all the fabrics in this quilt. 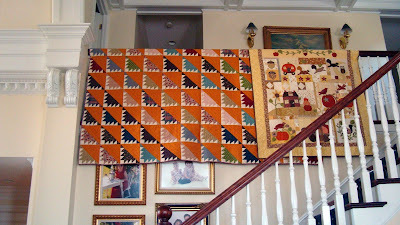 Lori's grandmother's quilts. Mostly never used and in mint condition. 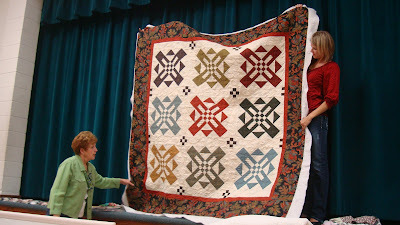 My friend Judi's stunning quilt. 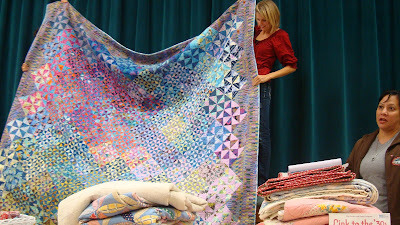 I want to make this quilt. It is just a show stopper. So is Judi. 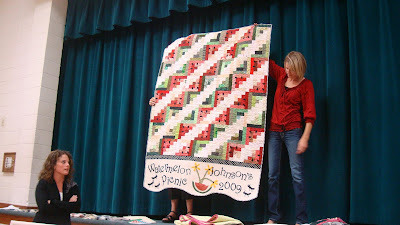 Cute watermelon quilt. Oh the days of summer are headed out. We had snow today. This picnic quilt won't see much use now until next year. Original design. this reminded me a cross between cathedral windows and medallions. Aniva's sweet baby quilt. 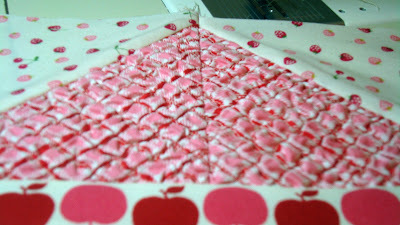 I love little quilts. 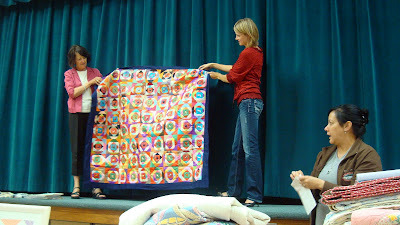 Aniva's daughter's quilt had a cute story. 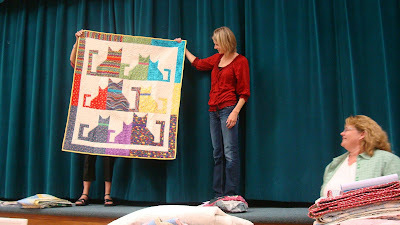 Aniva saved all these fat quarters that her daughter picked out years ago and managed to make them all work together in this sweet kitty quilt. 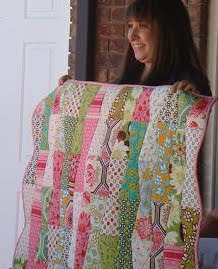 Sharleen's lovely sampler quilt. That yellow really tied them together. 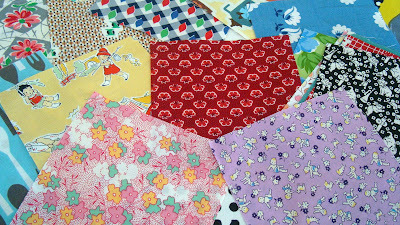 Sweet scrappy hearts made for a daybed after the size grew too wide. Smart thinking. 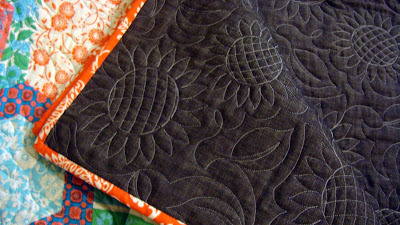 Bonnie's cross road quilt. She just got it back from the machine quilter, Wren. 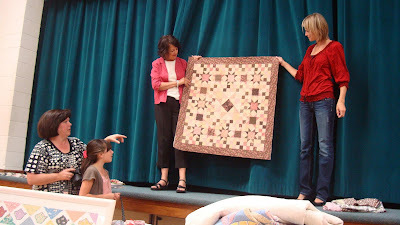 The wonderful Kim and her daughter Kenna showed this sweet brown and pink quilt. Show-N-Tell was so fun. More later. When I don't know. I had a few moments tonight to make a post. I hope everyone is well. Hi to all of you and thanks for your sweet comments and constant support. The first time I used Texture Magic was a while ago and I didn't understand the shrink ratio so I kind of messed up and my little idea failed because of inexperience and poor planning. 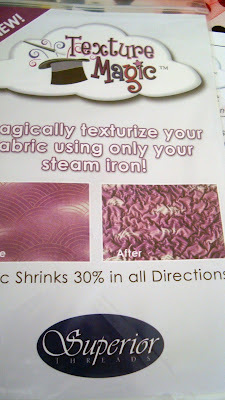 But since then I've listened to Nedra talk about Texture Magic and actually read the instructions (shocking, I know). So my 2nd go at Texture Magic was fun. 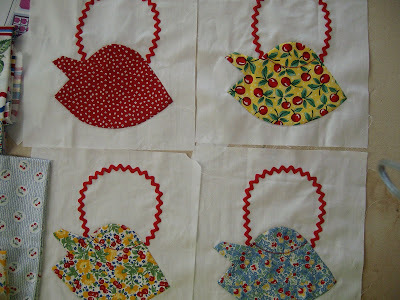 I'm making up another sample quilt of my "Kettles in the Kitchen" quilt. and wanted to see what Texture Magic would do for the roof of one of the little kitchens. It turned out really cute. I think when I quilt the sample quilt I'll just run a few quilting stitches over a few rows and it will look like I've super quilted the roof in a tile pattern. I will definitely do this again! I really love how this kitchen turned out with the apple fabric fussy cut as trim. I've had some wonderful ladies proof reading my pattern copy for me and also wonderful sewers proofing the pattern. And thank goodness for them because they have helped me with some silly mistakes I would have missed. I appreciate them so much, especially right now when I have not a moment to spare with my upcoming events. The above kettles were made by Diane. Thank you so much for the photo Diane. The kettles are so darling. They make me very happy. 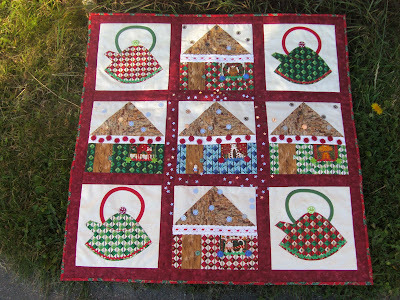 And Lotta in Sweden finished her small version of my "Kettles in the Kitchen" quilt and shared some photos with me. I love it. It turned out so cute! She made it with a Christmas theme and it couldn't be sweeter. What fabulous angels I have watching out for me. Thank you girls so much, all of you that have pitched in to help me. It's Friday. 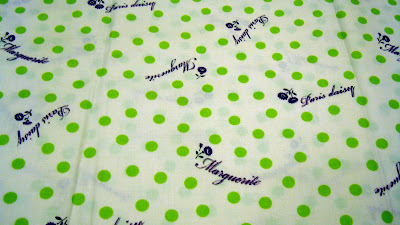 And I do have some fun Japanese fabric to show today. I am helping Flora with our Celebrate 30's night at our Alpine Quilt Group on Tuesday and I'm going to take a couple of the 30s repros to show. So below is a mix of 30's and others. This light green in feed sack logo print is really fun. 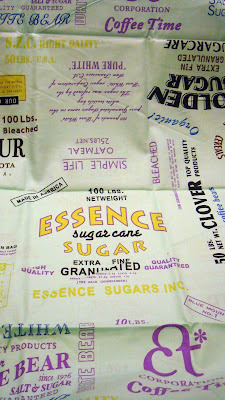 I love words on fabric and this one is exciting because it has so much packed into one print. 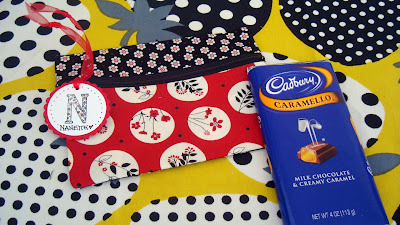 Along with collecting kitchen novelty fabrics but I also really like sewing novelty fabrics. This one has words and sewing icons. And you know I love dresses. Isn't this sweet dress and purse fabric so cute. This is a 30's Japanese repro. 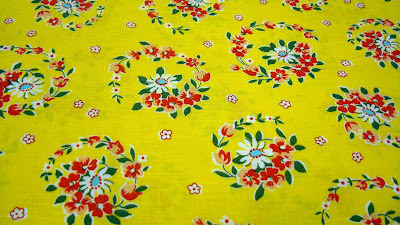 I used this fabric for a roof on one of my kitchens. I talk about that next week. 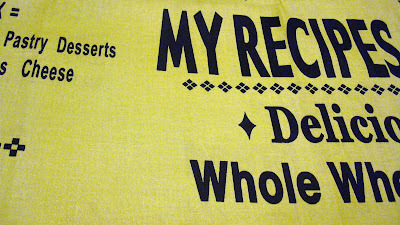 This yellow 30's repro print is really sweet. I could look at it all day. In fact I may put it up as my wallpaper. 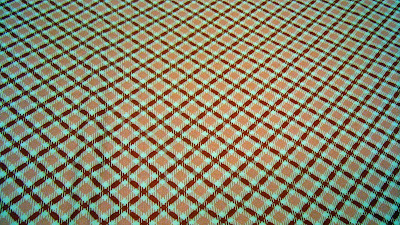 I have this kitchen words fabric in red and green. The green is a perfect green. This photo doesn't do it justice but I love this color. This is just a fun dot with words and names on it. I can think of some fun uses for it. I thought this was interesting. Both of these blue prints are really similar. But the blue is so different. 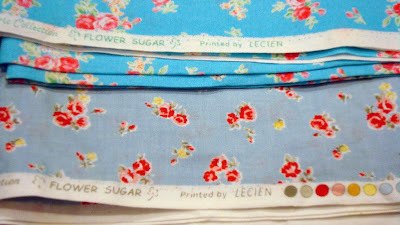 They both are by Lecien and both say Flower Sugar on the selvage. So would one of them be a first run? I have seen the upper blue with all the other Flower Sugar fabrics out for sale but this lower blue seems to belong to a different run of this print. I wonder what the story is behind the 2 color choices. If there is one. 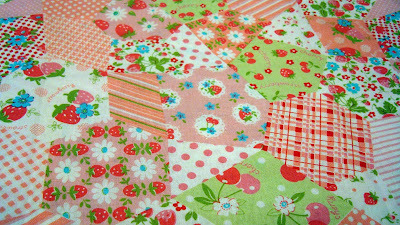 Strawberries are so fun on fabrics and this print above has a jumble of colors and designs so it is easy to use bits of it for different projects. I have this print in different color ways. It is so fresh and happy. 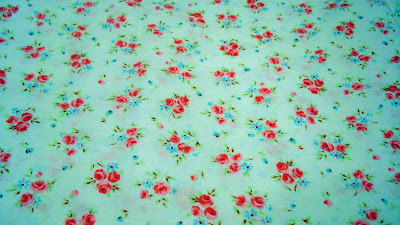 If you didn't already notice I love roses in fabric. For some reason Blogger isn't cooperating with me and won't let me change the arrangement of my photos. So here we are from our lunch last Friday. Me, Lori, Nedra and Kim. 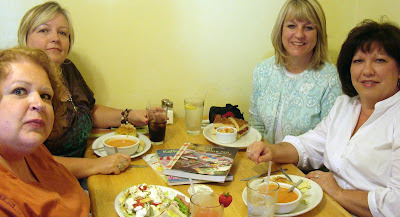 We had a really sweet time together talking, looking at quilt books (see middle of table) and thinking about planning a retreat together next spring. It was really fun. I need to do this more often! I wanted to make something fun to give the girls at lunch. 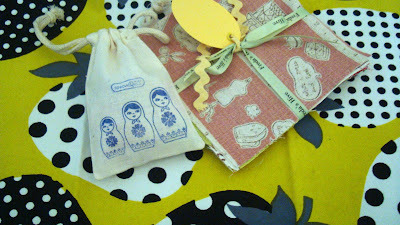 I used some old fashioned candy to fill a muslin bag that I stamped with the matryoshkas that Lori had given me previously. Natalie got the bags to give as favors at the wedding. And I swiped a few to use myself. I really should make some of these. And I made a custom charm pack to go with it. I think I'm going to make custom charm packs for Christmas gifts, too. Look at the sweet stuff the girls brought for us. It was like a little party where we exchanged gifts. Kim had a sweet little gift for me. I immediately put my purse set of make-up in this little bag. It fits great in my purse. Kim's work is sheer perfection. Of course. And my kids ate my candy!!! Thanks again Kim. This little charm pack is from Lori. It is funny. We have to laugh when we are together because we even finish each others sentences. We both think on the same wavelengths so it was funny we both brought charm packs to share. 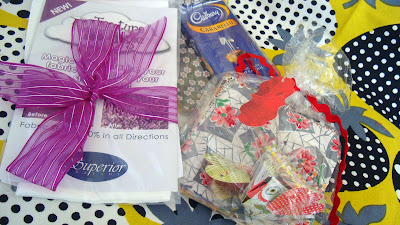 She also brought us a little pack of hollyhock seeds (favorite flower) and candy in this cute chicken box. 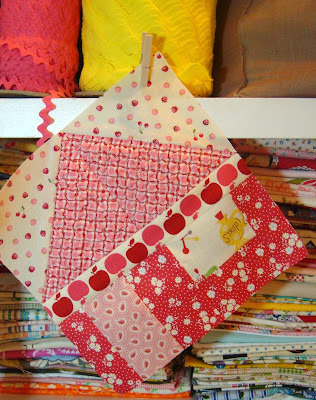 The chicken box looks like the chicken pincushion pattern I have (and haven't made yet!). 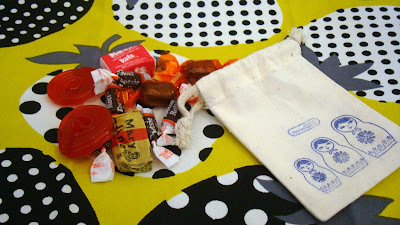 Lori had some goodies in there including some of her grandmother's vintage fabric! I love all of them. Thanks so much Lori. Nedra brought some Texture Magic. I used a little bit of it the other night. I'll show that later since I'm having trouble with blogger and photos. But it made a really cute roof for one of my houses. Thanks so much Nedra. 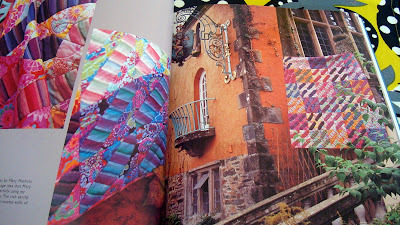 We enjoyed browsing through our colorful new quilt books. I had the new Kaffe book. Look at the photography! 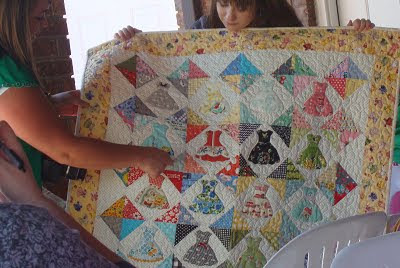 I really want to make this pickle dish quilt. I absolutely love it. But I'm not a fan of foundation piecing. Nedra promised to help me with it sometime. 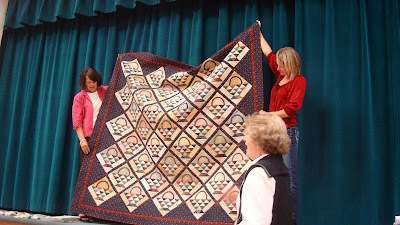 I've seen this quilt in photos lately around blogs and I'm just captivated by the different colors in each version of the quilt and how amazing it is in any colorway or fabric. Today Jamie is 19. Can you guess which daughter she is? Hint - not the pregnant one. Jamie is a funny kid. Those of you that know her understand that she is 19 going on 5. 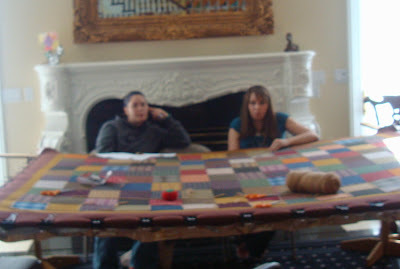 Left to right: Jamie, Whitney and Laurie. This was taken at Natalie's shower on Saturday. Between now and Halloween 5 of my 8 kids have birthdays. Ridiculous. I know. But today is Jamie's day. 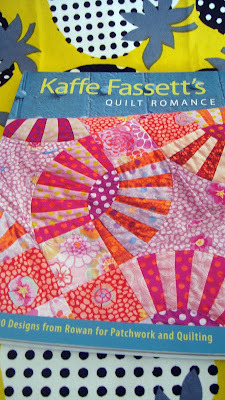 Jamie is not a quilter and I really don't see that in her future. Ever. She's a sporty girl (remember the Eagles quilt from her graduation) and she LOVES basketball shoes. 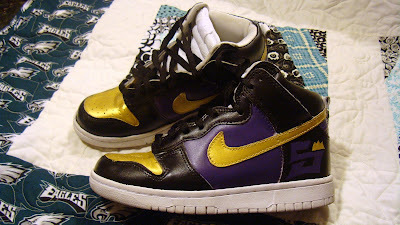 But she's got a little creative side so she likes to paint her basketball shoes. I think she really does a good job. 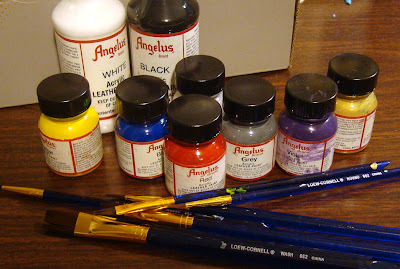 Jamie uses these leather paints and I'm all for anything crafty. I just don't see a custom paint job on my feet anytime soon. The rest of this post about the showers for Whitney and Natalie. And most of them were taken by Laurie (see above). Her perspective is a little different than mine. I usually think "what would look good on the blog" like center pieces, decorations, etc. I guess next time I'll have to do less visiting and more photography myself. 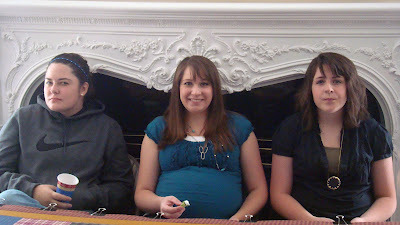 My daughter Whitney's baby is due October 19. Her in-laws had a shower for her a couple weeks ago outside in their beautiful yard. And Whitney got some really fabulous things to start out her new little life as a soon-to-be mommy. 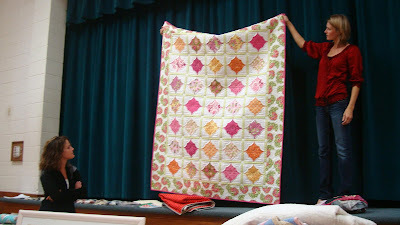 I gave Whitney one of my sample "All Dressed Up" quilts. And one of my tumbler bow quilts I had made a while ago. I think she can make a good start with these two and we'll work on other quilts later. 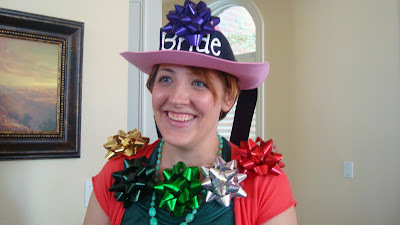 Last Saturday was Natalie's bridal shower at her Aunt Lorraine's house given by her grandmother and 3 aunts. Again, sorry I didn't get all the cute decorations and fun stuff in the pictures. Everything was so lovely and all decorated with cowboy theme to go with the wedding. Lorraine is a fabulous quilter. 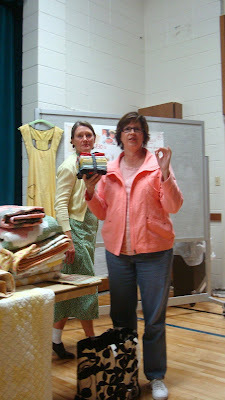 I told Laurie several times to make sure that Lorraine's quilts were photographed. So at least I have something fun to show you. 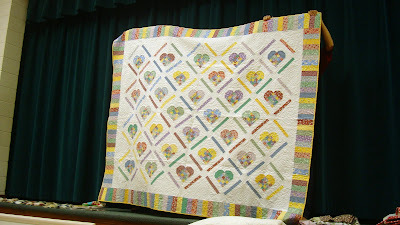 This is one of the lovely Lori Holt quilts that Lorraine has made. 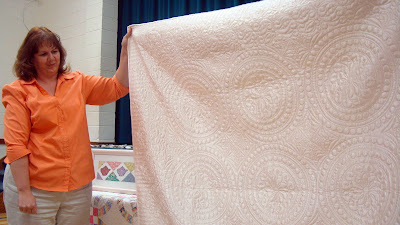 I love this orange quilt and the fall Bunny Hill pumpkin quilt, too. Someday I'll make that quilt. Eek. Really bad photo. 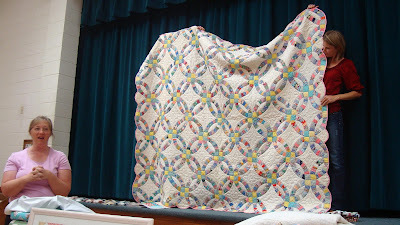 But this was the only photo of the tied quilt that was up for us to work on for Natalie. The quilt is super cute. When it is bound I'll show it again. 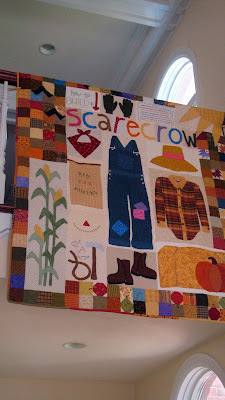 The underside is darling cowboy fabric and I love the patchwork flannel on top. I made Natalie an engagement quilt and had it bound just in time (the night before the shower). 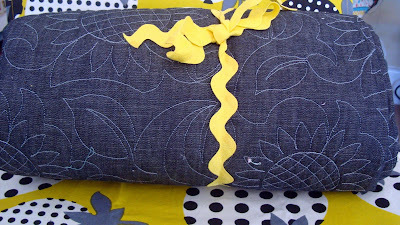 The back is denim and was quilted in a sunflower pattern. Sunflowers are her main wedding flower. I used a whole cloth approach with Jennifer Paganelli fabric. I really love this hexagon from her "Dance with Me" Sis Boom line. It was too pretty to cut up and represents the colorful approach that will be taken to the wedding. I thought it would be a fun camping quilt for the newlyweds. I don't really have time to proof this post so I hope this all makes sense. If not, oh well. Thanks for your sweet kind words, always. Wonderful women read my blog and understand. Texture Magic Roof and Pattern Tester Success! It is criminal . . .